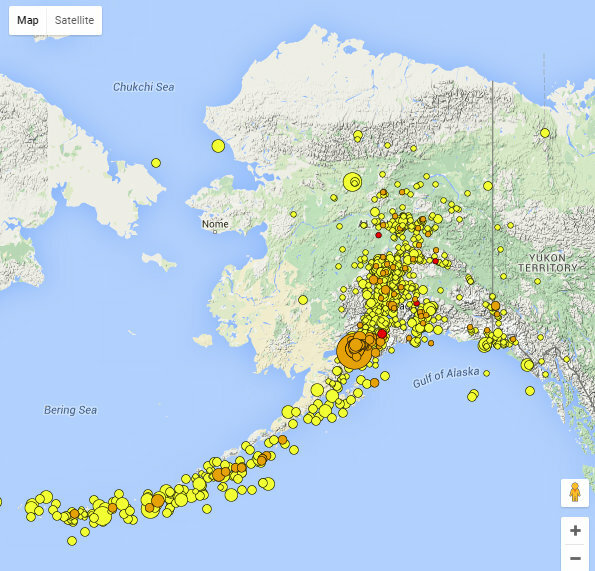 Fairbanks, AK…A damaging magnitude 7.1 earthquake occurred at 1:30am Sunday, 60 miles west of Homer. So far there are no reports of injuries. According to KTUU, gas leaks on Lilac Lane in Kenai resulted in one house fire and the evacuation of residents from 20 or so homes to the National Guard armory. The earthquake also damaged Kalifornsky Beach Road about a mile from the Sterling Highway and caused power outages affecting over 10,000 homes across Southcentral Alaska. The depth (76 miles) and location of this earthquake indicate that it occurred inside the subducting Pacific Plate rather than at the place interface. The rupture was caused by extension of the plate as it is pulled into the mantle by its own weight. This is a common type of event for this region and depth. However, at magnitude 7.1 it is the largest intermediate-depth earthquake recorded beneath Cook Inlet since the regional seismic network was established in late 1960s. Earthquakes of similar sizes occurred in the Lower Cook Inlet in 1912 and 1933, but we do not have precise magnitudes and locations for that time period. We recorded about 30 aftershocks in the first 2.5 hours after the earthquake. The largest was a magnitude 4.3 at 12:37 UTC (3:37 am local). Aftershocks are continuing at a steady rate and can be expected to go on for several months, although the rate of aftershocks should decrease considerably after a couple of weeks. The National Tsunami Warning Center reported no danger of a damaging tsunami after this earthquake.